Our Father cares for His children so much and longs to have this close relationship with us. So many of us take this for granted and don’t go to Him with all our cares. Casting all your care upon him; for he careth for you. (1 Pet 5:7) Don’t you desire to run to a place where the Father is waiting to listen to your every word? He is not distracted by the television. He is not indifferent to your needs. He will be as close to you as you allow Him to be. Do you think our Heavenly Father was trying to communicate something to His children? I surely do! Let’s pick out the specific terms used and meditate on them a bit. 1. Any fortified place; a fort; a castle; a strong hold; a place of defense or security. The English have a strong fortress on the rock of Gibraltar, or that rock is a fortress. 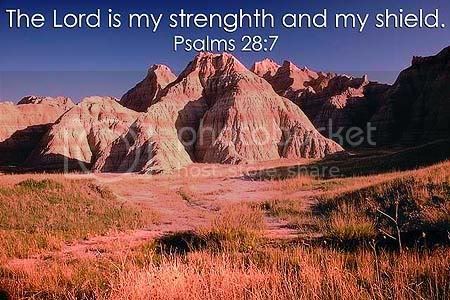 And he said, The LORD is my rock, and my fortress, and my deliverer; (2 Sam. 22:2) God is our defense and our security. When we are walking in Him (not the world), we can be assured of this! God is our Deliverer. Christ has rescued and delivered us from an eternity of burning in hell’s fires, total darkness and separation from God! And so all Israel shall be saved: as it is written, There shall come out of Sion the Deliverer, and shall turn away ungodliness from Jacob: (Rom. 11:26) He also delivers us from evil as He taught us in His example of how to pray. Support; that which supports; that which supplies strength; security. The Lord supports us, supplies us with His strength and gives us security in those times when men fail us! And he said unto me, My grace is sufficient for thee: for my strength is made perfect in weakness. Most gladly therefore will I rather glory in my infirmities, that the power of Christ may rest upon me. (2Co 12:9) Oh thank You, Lord! God is our Buckler. I had a mental picture of what a buckler was but reading Noah Webster’s definition made my heart leap! Notice how the buckler was worn on the left arm – protecting the heart of man. This same buckler causes the enemies darts to fall off. I love how the Lord is our defense – our buckler – protecting us from the enemy! When we abide in Him, we have His protection over us. I think of being under His wings at this point! God is the Horn of our Salvation. Horns were a big part of the Bible. They sounded for danger, they were used for heralding an event, etc. Jesus Christ is the only One who can provide us with salvation – there is no other. And hath raised up an horn of salvation for us in the house of his servant David; (Luke 1:69) Jesus saith unto him, I am the way, the truth, and the life: no man cometh unto the Father, but by me. (John 14:6) Neither is there salvation in any other: for there is none other name under heaven given among men, whereby we must be saved. (Act 4:12) I am so thankful that my salvation rests in Jesus Christ. He is the only One – no other! We have a God who sits atop a high tower watching out for us, shielding us and protecting our hearts from the enemy. Our salvation is secure in Him and He provides us the strength we need to deal with the enemy. He delivers us from the temptations that He sees coming. As long as we stand on His Word (His Rock), we have no need to fear. So that we may boldly say, The Lord is my helper, and I will not fear what man shall do unto me. (Heb. 13:6) Oh thank You, Lord, for this blessing today!